Alfred 3 only. For Alfred 2 support, please download version 1. 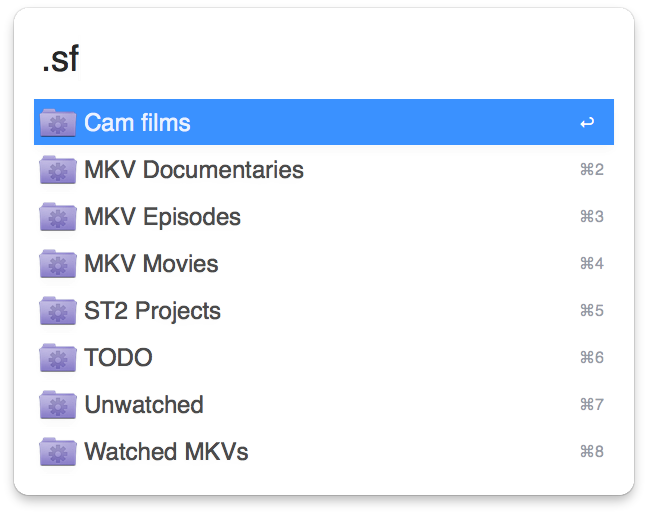 List all the Smart Folders/Saved Searches (same thing) on your system and drill down into their contents. Works in much the same way as Alfred's File Filter, but Smart Folders are also available outside Alfred and are a bit more flexible. What's more, you can exclude specific filetypes with a Smart Folder, which Alfred cannot do. You can also set up your own Script Filters with a custom keyword that go straight to the contents of a specific Saved Search. For example, I have a Saved Search called "TODO" which contains all files/folders tagged "todo". I have linked this Smart Folder to the keyword .todo in Alfred. See the included example and the help file for more details. There is a bit more info on the Alfred Forum page and the source can be found on GitHub. Feedback and contributions welcome.